Let’s say you have a goal that’s audacious and unconventional. You want to create $45,000 per year in passive income. Or you want to live 100 percent debt-free. Or you want to spend a year traveling across Europe, South America and Southeast Asia. Maybe you’d like to take 6 months off work to garden, exercise, and spend time with your kids. Or to focus full-time on starting a business or becoming an artist. Let’s look at the numbers. Let’s assume that you have a take-home pay of $50,000 after taxes and after other paycheck deductions, such as 401k and HSA contributions. Let’s also assume you’re financially solvent. You have an emergency fund. You don’t have high-interest debt. Everything you save can get dedicated to your audacious idea. Your dream is to take a one-year sabbatical from work. You want to enjoy a mini-retirement. Based on those assumptions, with a take-home income of $50,000, how soon could you save enough to cover your annual cost-of-living? If you save 10 percent of take-home pay, you’d reach your goal in 9 years. If you save 20 percent of take-home pay, you’d reach your goal in 4 years. If you save 30 percent of take-home pay, you’d reach your goal in 2.3 years. 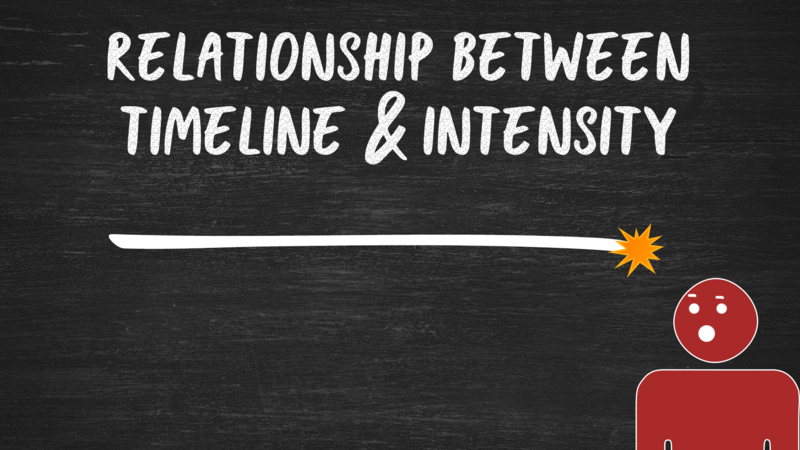 What we’re seeing is the relationship between timeline and intensity. If we casually save, we reach goals slowly. If we intensely save, we reach goals faster. Walking, jogging and running will carry you across a mile. The difference is speed. One of those statements will always be true. The other won’t. If you stroll, it will take forever. But your efforts will be minimal. If you sprint, you will need to be obsessed. But you’ll reach the finish line faster. Imagine losing one pound per month. Your lifestyle changes would be minimal. Swap out sodas for water. Replace cupcakes with fresh fruit. Your progress will feel like nothing. But after a year, you’ll have lost 12 pounds. By contrast, imagine losing one pound per week. Your lifestyle changes would be drastic. But in less than 3 months, you’ll have lost those same 12 pounds. P.S. Coming soon — my 2017 rental property income report and year-in-review! Stay tuned! Nice post, folks have to be able to play the long game. I think too many people underestimate the factor that long periods of time can play with seemingly negligible results. It’s kinda like rust, you don’t see it move but it’s moving! Exactly! It’s like rust, or growing grey hairs, or gaining muscle. It happens so slowly that week-by-week you don’t necessarily see any change. But when you zoom out, you see the difference. Or, alternately, you DO see change rapidly, but this requires a single-minded devotion to the cause. Exactly. And known yourself – some of us want to be sprinters but we just aren’t, constitutionally we are ambling strollers. Which is totally okay, so long as we recognize that we wont see that intense progress associated with our lower energy, longer term efforts. It doesn’t make it a less valid strategy, just different. And it’s a sliding scale. Everyone can find their comfort zone. You don’t have to crawl, you can walk, jog, run, or sprint or any speed in between. Find your happy speed and go. It really is not rocket science, but it holds so many people back. This is one of the truth people often neglected. I can see how much you value what limited time we have. You don’t give time for money, you give value(efforts) for money. People often wish they could have more time, but the solution is simply to do most of our time. Thanks for sharing Paula! Energy / mental bandwidth is EVEN MORE limited than time. i found that momentum played a big role in paying off all of our debts quickly. you start to see positive results and the walk turns to a jog to a sprint as enthusiasm rises with a little success. but you gotta start. Thanks for this! I’m so amazed at 10 years without working is pretty good. I did have a question. Do you think debt settlement is a good way to get out of debt? I’ve got about 40k in student loans and [link redacted] claims he got out of 65% of it?! Do you think its true or hoggwash? I made one of the most consequential mistakes a person can make with their finances: a failure to be balanced. I was intense…for several years. Extremes are easy for me: spend it all or save it all. I saved because it prevented buyer’s remorse. If I didn’t buy anything, well, no remorse. Also, saving is a regret proof activity… or so I thought. Now, I’ve hit the perverbial financial wall. In a nutshell, I’m financially fried. Now I’m desperately trying to get my financial second wind and become balanced from here on out. I find comfort in the fact that there is no right or wrong in any approach, only different routes to the same place. For those that choose the intensity pathway, don’t forget to live a little in the meantime. I did forget and now I regret it, big time!! Paula – thank you so much for sharing this! I know some one who has the same problem in regards to withholding both her money and time. Of course it’s good to save, but you have to live a little too along the way or you’re more likely to be miserable – and even suffer bouts of or permanent depression. I hope to share your post. I recently started to hear your podcast and came across your website, I love the way you write! I felt very much identified with this post. My partner and I are 2 months into our FI journey and I am trying to find the balance between timeline and intensity. How to reach FI as soon as possible without feeling you didn´t enjoy the years in-between. I used to be more into the intensity side of things, but as I get older I am changing my approach towards incremental changes. Especially when it comes to my FI strategy, because I want it to be sustainable long term. However, I am only two months in and I am starting to get a little obsessed over my expenses, which makes me worry that I´ll burn out. How was it for you when you were just starting? Did you feel “guilty” for spending in things that were not necessary but you enjoyed (theatre, travel, eating out)? Time is the most powerful thing.Once time is gone it will never come back again.So doing things on time never makes us feel regret for what we have not done at the right time.